Why is Stephen Curry smiling? He has an adorable daughter, another child on the way, the sweetest stroke, an MVP and an NBA championship. This story appears in the June 29, 2015 issue of SPORTS ILLUSTRATED. To subscribe, click here. ​Steph Curry stood on the corner of West 2nd Street and West Prospect Avenue in downtown Cleveland, smoking a cigar. It was 4 a.m. and the only passersby seemed to be homeless, drunk, or affiliated with the Warriors, who had just captured their first NBA championship in 40 years. Police spotted Curry lingering outside Morton's The Steakhouse, in a black dress shirt over dark jeans, and asked if he wanted some protection from onlookers. He was flanked by his father, Dell; Golden State's coach, Steve Kerr; and the team's player development coach, Bruce Fraser, who trains him every day. Between puffs the group marveled at the circular nature of life, how Steph was born 45 minutes away at Akron General Medical Center, and how he returned 27 years later to realize his destiny. Dell shared a memory of Steph, when he was a month old, napping in his crib on the second floor of the family's suburban apartment. Dell's wife, Sonya, had gone out for a few hours and he was watching the boy alone for the first time. When Steph woke, Dell picked him up and carried him downstairs, but the young father was wearing socks and slipped on the hardwood. Dell fell down six steps, bruising both elbows, thinking the entire time, "My wife will kill me if I drop this baby." He never did. The story reminded Kerr of his own son, Nick, who was also born nearby, at University Hospitals of Cleveland. Like Dell, Steve played for the Cavaliers, and like Dell, he did not stay long. When Nick was three weeks old, Steve was already packing up the condo, traded to Orlando. That was 22 years ago. Today, Nick is a graduate of the University of San Diego, starting on a master's in public health at Cal this fall. Time disappears like rings of smoke in summer air. "When are you going back to San Diego?" Fraser asked Kerr. "Saturday?" "Maybe Friday," Kerr replied. "Right after the parade." "Friday? What about the exit interviews?" Kerr glanced at Steph. "What did you think of the year?" "I thought it was incredible," the point guard said. "I thought it was incredible too. But you could really be a better shooter. I think you need to work on your shot this summer. Great year. Give me a hug." ​So concluded the most succinct exit interview ever, relayed by Fraser, and the most sarcastic. What more was there to say after Curry won the MVP and the title, broke his own record for three-pointers in a season and nearly doubled the mark for threes in a postseason? What more was there to say to all the Warriors after they went 83—20, 48—4 at home and won more games than any team that did not employ Michael Jordan? NBA champions traditionally suffer years of playoff agony before claiming their crown. Yet here were the Dubs, youngest champs in more than three decades, going straight from a first-round knockout to a nine-month joyride. Kerr watched the spring's other wire-to-wire winner, American Pharoah, and chuckled at his favorite postrace tradition: the horseback TV reporter asking the jockey, "Tell us about your trip." So, Steve, tell us about your trip. 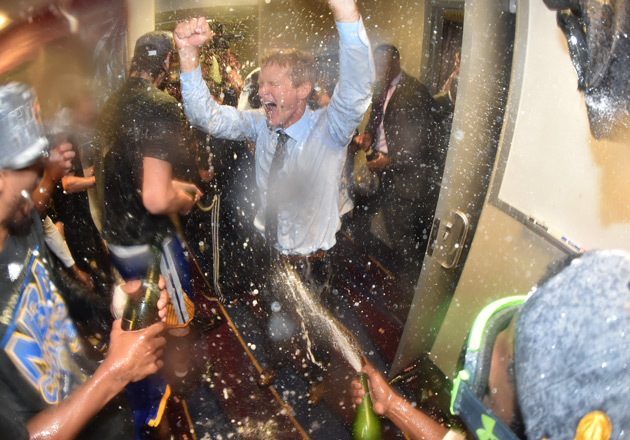 In training camp, Kerr informed the Warriors, "We have the pieces here for a championship. Now I'm not going to talk about that again." He didn't, and at times the rookie coach lost confidence, until March 18, when Golden State blew out the Hawks with 39 of 44 baskets assisted. "This could be special," Kerr told his wife, Margot. She owns a bracelet, too flashy to wear, with the ring faces from each of the five titles he won as a player. It was time to make room on the chain. The parade is over, having snaked through 1.1 million people from downtown Oakland to Lake Merritt, and Curry is mingling in the back of a white party tent. The Warriors surround him, smiling, hugging, and nibbling artisanal pizza from the spread at the center of the room. Beyond the tent, the throng stands in the sun, waiting for one more glimpse of the players. "You know what this makes me think of?" Curry asks. "'Can you dig it!?'" That was Shaquille O'Neal's catchphrase, bellowed in 2000, at the first of three consecutive Lakers parades. Curry surveys the room: shooting guard Klay Thompson, 25; power forward Draymond Green, 25; small forward Harrison Barnes, 23—the bedrocks of another potential West Coast dynasty. "This feels like the start of something," Curry says. "I now understand why the greats, who win multiples, have the mentality they do. The feeling is intoxicating." As Curry continues, the crowd in the tent swells. Cameramen approach with boom mikes. Friends try to catch his attention. Everybody seems to be shouting, except the man in the middle of the ruckus, who never raises his voice or shifts his gaze. Curry understands the importance of public posture. He keeps an "image card" on the inside wall of his locker, which he received in the rookie transition program in 2009, instructing him to use "strong positive body language," "good eye contact" and "inflection in your voice." But he can't manufacture inner peace, the unmistakable serenity that allows him to focus amid frenzy, and hurl flames at giants. ​"For me, that comes from faith and family," Curry says. "It's who I am. It gives me balance. This is a high-pressure job. You gotta win. You gotta win. You gotta win. If you can turn it off for a while and make life normal, you can balance yourself out before you have to do it all over again." His parents stayed at his house during the Finals, an arrangement that would rattle some players, but relaxed Curry. Dell, a shooting guard for 16 seasons who never advanced beyond the second round, drove with Steph to Game 1 at Oracle Arena. "I wish I could tell you what this is like," Dell said, and they laughed. After games Steph played spades with Sonya until his mind mellowed and sleep beckoned. Only now, in the parking lot of the Henry J. Kaiser Convention Center, is he alone. Everybody else in the organization has ascended to the stage for the postparade rally. Green has posed for pictures with the Oakland police, telling them, "I'm flying past every one of you on the street." Finals MVP Andre Iguodala has pantsed Thompson. Curry finally walks up the steps and peers over the lake, reminded of his first Bay Area apartment. Six years ago the Timberwolves drafted two point guards in the lottery, passing on Curry both times. Four years ago Warriors coach Keith Smart used Acie Law in the fourth quarter of games, believing the team was better off with Curry on the bench. Two years ago Nike declined to match an endorsement offer Curry received from Under Armour. Today, he is the face of basketball, furthering the quaint notion that anyone with a Spalding, a hoop and a ravenous hunger can vanquish LeBron James. You can be 6'3", 190. You don't have to look like a superhero. It is a sweet sentiment, though Curry is no less superhero than James. Curry's secret power—sublime hand-eye coordination—is just harder to detect. If James is a blunt weapon, Curry is a finely tuned instrument, maintained through meticulous routine. He walks to the court, pumping his arms like a drummer boy, with power forward David Lee. He ties his shoes on the same chair, shoots on the same rim and takes that last heave from the tunnel with the same security guard, Curtis Jones. He endures the obvious OCD jokes. "The routine gives me things I can count on," Curry explains. But the Finals steals comforts, replacing golf outings with travel days, forcing practices from familiar gyms to cavernous arenas. Fraser, who works with Curry more than any other Warriors coach, wondered how his carefully calibrated megastar would acclimate. Even the trips that look easy never are. On the off day between Games 3 and 4, the Warriors practiced at Quicken Loans Arena. 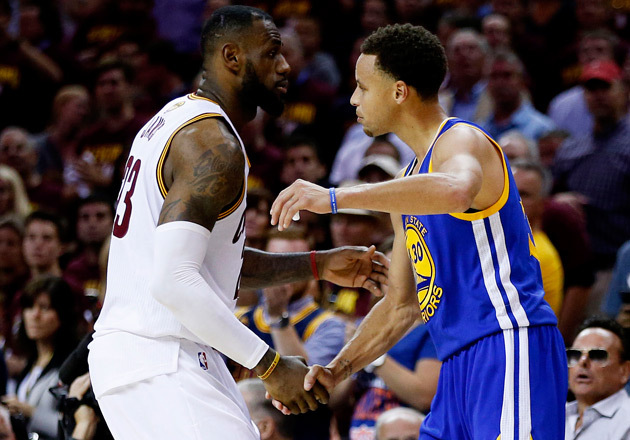 They trailed the Cavaliers 2—1 and were concerned about Curry. He fell on his head in the Western Conference finals against the Rockets, and though he downplayed the effects, coaches believed he was reluctant to drive to the basket. In the four games after the spill, he shot 38.1% from the field and 31.1% from three, culminating in a 5-for-23, 2-for-15 clunker in Game 2. He was out of tune. Maybe the fall caused the slump, or maybe the Finals itinerary was to blame. It could have been both of those, or neither, just a guy finally clanking a few open jumpers. During that practice in Cleveland, Fraser told Curry, "I want you to think about this." He made a motion with his hands, raising an imaginary ball from his belly to his neck. The Warriors implemented a handful of ingenious adjustments throughout the playoffs. Against the Grizzlies, they put center Andrew Bogut on guard Tony Allen and dared him to let fly, while double-teaming power forward Zach Randolph and funneling him toward the baseline. Against the Rockets they switched Barnes onto shooting guard James Harden, and against the Cavs they started Iguodala for the first time this season, using the 6'7" Green at center. What Fraser did for Curry between Games 3 and 4 did not fall in the same category. He used to suggest adjustments in release point, arm angle, foot position. Then, in the middle of games, Curry would misfire and ask Fraser, "What's wrong? What are you seeing?" ​Fraser feared that Curry was overanalyzing what he said, not an unprecedented occurrence. The first summer that trainer Rob McClanaghan worked with Curry, at a Bel Air home gym in 2013, he told him to split an imaginary ball screen, drive down the middle and put up a floater. Three minutes of questions followed. "Where is the ball screen set? How many dribbles after the split? Where exactly do I take off? Do I jump off one foot or two?" In the summer, inquiry is encouraged, but in the season a shooter needs a clear head. Fraser backed away, and when he wanted to offer a suggestion, he expressed it in the broadest terms. Think about this. In Game 4, Curry took Fraser's general advice and made a subtle mechanical tweak, extending the ball a little farther from his body as he raised it. "What I did was so slight, nobody would have noticed," Curry says. "I don't know if that was the key, but Bruce got me thinking, and that got me more locked into feeling my body." Again, it is impossible to pinpoint what throws a marksman off-track, and what eases him back on. But Curry was steady in Game 4 and sensational in Game 5, putting up 37 points on 13-for-23 shooting. The forever sequence of Curry's playoffs was his game-tying corner three in the first round while getting knocked down by two Pelicans—"With his eyes closed," Sonya adds—but the double-crossover step-back three over Matthew Dellavedova in Game 5 ranks a close second. The MVP was back, and two days later, the Delly was closed. It is popular to call Curry the finest shooter of all time, but in some ways, that title shortchanges him. "He's a shotmaker," says McClanaghan, who trains many premier point guards. "He's not just out there shooting threes. It's five dribbles, behind-the-back and through-the-legs, then a step-back three or a floater with the left or the right hand. That's more than a shooter. That's someone who does it all." In the end Kerr buckled to convention, conducting exit interviews at the practice facility the day before the parade. "I have to be more consistent," Curry says. "We're going to get everybody's best shot, so if I don't improve, it will show." He has rushed headlong to the top. The Warriors daydream about what he can accomplish if he learns to change speeds and exploit angles, as Steve Nash once did. The specter of the two-time MVP has hovered over Curry since the moment he entered the league. "I drafted him partly because he reminded me of Steve," says Don Nelson, who coached Nash in Dallas and Curry in Golden State. "They are very similar." Curry was more aggressive than Nash; Nash more probing than Curry. Four years after Nelson retired to Maui, Golden State coincidentally started hiring people who used to work with Nash in Phoenix: Kerr, Fraser, guard Leandro Barbosa and assistant coach Jarron Collins. ​Nash was employed by the Lakers but sat out all season with nerve damage in his back. He passed casual advice to Curry, via Fraser. When Curry slowed before the All-Star break, amid photo shoots and public appearances, Nash cautioned him about the cumulative effect of off-court commitments. When Curry received his MVP trophy in a pregame ceremony during the conference semifinals, Nash warned him that it would be hard to settle his emotions. The Warriors promptly sustained one of their two home playoff losses. In an interview announcing his retirement three months ago, Nash said he had no plans to coach, though Fraser did once flip him a Golden State staff shirt. But Nash enjoys tutoring players individually, and the Warriors are trying to set him up with Curry. So if you happen to swing by a Boys & Girls Club in San Diego's North County this summer, don't be surprised to see a couple of historic point guards inside. Of course Curry could also do nothing but golf, and Golden State would still be in pole position come opening night. Every major contributor will return, including Green, a restricted free agent the Warriors intend to re-sign. "You just don't want to mess it up," says general manager Bob Myers, who grew up in the San Francisco suburb of Alamo, rooting for Sleepy Floyd and Run TMC. "But you also don't want to be too passive." In the cutthroat Western Conference, standing pat can mean falling behind. The Thunder, assuming Kevin Durant's troublesome right foot heals, will contend again. The Clippers, who acquired volatile swingman Lance Stephenson last week, will be a threat to others as well as themselves. The Pelicans, who hired coach Alvin Gentry off Golden State's bench, will take a leap. The Rockets are still an enticing destination for a third headliner. The Grizzlies and the Spurs aren't going anywhere. And if the Warriors do survive the West gantlet again, James will likely be waiting for them once more, with reinforcements next time. ​"It's going to be the same fight, the same game," says Seahawks tailback and Oakland native Marshawn Lynch, who attended the rally four months after his team came one yard short of a repeat. "Your mentality can't change. Your hunger can't change. But I don't know. I didn't do it." Mychal Thompson, Klay's dad, did go back-to-back 27 years ago with the Lakers. "Winning the first one gives you presence," Thompson says. "It gives you belief. You get behind, you feel like you can come back, like no moment is too big." Golden State's offense, like San Antonio's, is based on reads atop reads. This season the Warriors led the league in points by a wide margin, but they can grow more prolific, as they peel back the system's layers. Assistants caught themselves on flights in the Finals talking excitedly about training camp. Defense could be a challenge, since Golden State's switch-all scheme demands max effort, and championship runs sap everybody. But the Warriors are a different crew, led by two sons of NBA players and several other offspring of educators. They are unusually functional. Kerr called only two team meetings. Their biggest scandal might have involved a song, "CoCo" by O.T. Genasis, which they belted out on the plane after victories, Barbosa adding Portuguese exclamations. CoCo refers to cocaine, and when executives requested that the players stop singing it, they complied. But to the Warriors, the tune was symbolic of a bond, not a drug. So upon dispatching the Cavaliers, they gathered in a private room at Morton's and hollered the lyrics as loudly as they could. Curry, forever on the perimeter, listened with his wife, Ayesha, and two-year-old daughter, Riley. The next night, Curry held a backyard barbecue, while Game 6 re-aired on TV. Even after the parade, when most of the Warriors jetted to Las Vegas, he stayed home for the weekend. Dell wanted to play golf, Riley wanted to roller skate, and Ayesha needed to rest. She is due with the next Curry in July. Basketball's first family is booming.